People often say nice things about my work - the image above is the latest example. I'm incredibly grateful to my readers, fans, other authors, book bloggers and everyone else who talks about and supports my writing. 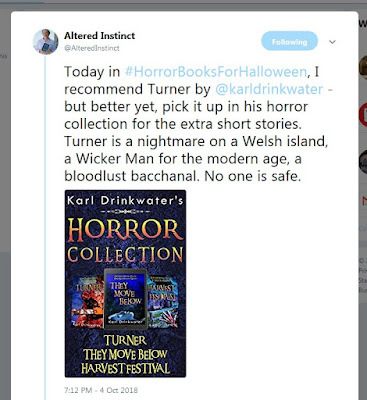 Altered Instinct included that tweet in their Horror Books For Halloween post, so go and have a look at all the other recommendations! If that's not enough, here are some of my own favourite horror reads from 2018. The Tank by Nicola Lombardi. This crazy book really impressed me, despite the terrible translation, and often left me sickened but unable to stop reading. I had a lovely chat with Nicola after I wrote my review, and encouraged him to keep writing standout stories like that. The Sadist's Bible, by Nicole Cushing. A really satisfying horror novella that kept me riveted until the end. Body of Christ by Mark Matthews. Another really good novella. "Bent" in Rebecca Rowland's collection The Horrors Hiding In Plain Sight. Gruesome and short and inevitable. Good stuff. Midnight Gods by Greg F. Gifune. It cuts out all the filler and confidently leads you from scene to scene as the horror grows from a late-night encounter. If you want to know some other recommendations from previous years, there's Housebroken by The Behrg, which I see as a great example of being able to take a book in unexpected but satisfying directions. 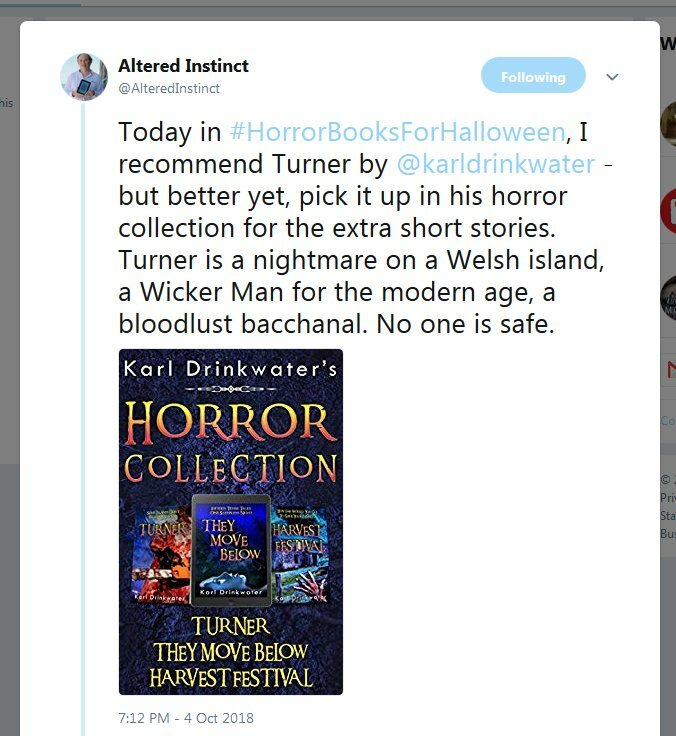 I also recommend trying some Koontz books, or sci-fi horrors that stayed with me, or a few classics.